Is it too soon to think about a Memorial Day gathering (be it a picnic, lunch, or “Hello Summer!” dinner)? Probably not for me. I love gathering folks together for a good meal. And besides great recipes, I like collecting ideas for clever ways to serve food. I’ve found some great ones that will definitely show up on our Memorial Day table. For instance, how cute is this? Squares of mozzarella cheese (these have been marinated), topped with small pieces of barbecued chicken, with a sprig of fresh rosemary holding it all together. 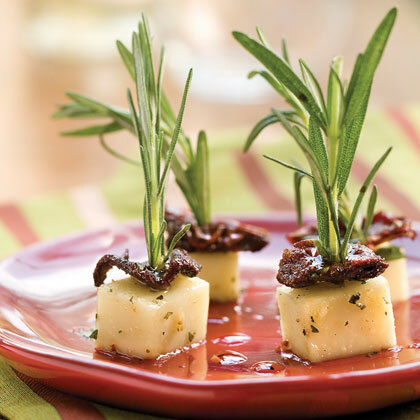 And the fresh rosemary stems not only add flavor, they also provide the perfect way to pick up the cubes of mozzarella. Or how about these enchanting individual veggies and dip? They’re served in hollowed out, thickly sliced baguettes. Just fill each baguette “container” with your favorite vegetable dip, garnish with veggie sticks of all varieties. 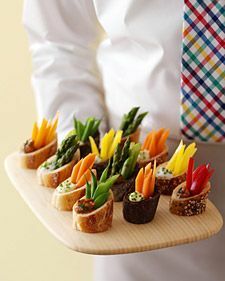 Celery, carrot, and bell pepper sticks are shown along with roasted asparagus spears; even thin turnip sticks would be good. Some dishes are naturally messy, such as certain tapenades and caprese concoctions. 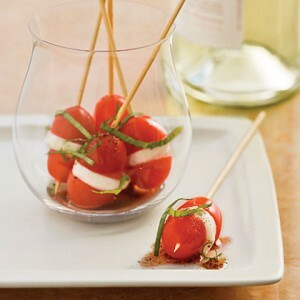 The problem is solved, however, by converting traditional caprese to mini bites—ala kabobs. They look elegant and are manageably eaten. There’s little risk of someone squirting tomato seeds all over themselves with these little treats. Experiment with taking some of your favorite tapenade ingredients or other hors d’oeuvres and making mini bite-sized kabobs out of them. And what a clever way to serve a light after-dinner dessert! 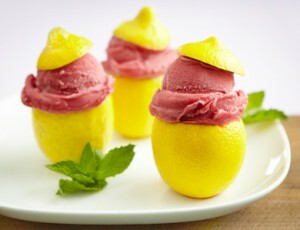 Wouldn’t these little lemon bowls be a show stopper? And think how great the raspberry sorbet or lemon gelato piped inside will taste with that hint of fresh lemon it gets from its natural bowl? Along this same line is the chili baked in scooped out onions (so delicious). It’s true that these types of dishes can take a little longer to prepare, although a good melon- baller makes the job easier. So maybe save these fancy presentations for smaller events where you have a little more time—or for when your kids, nieces or nephews want to “help” you in the kitchen. But there’s no denying the idea is simply charming. 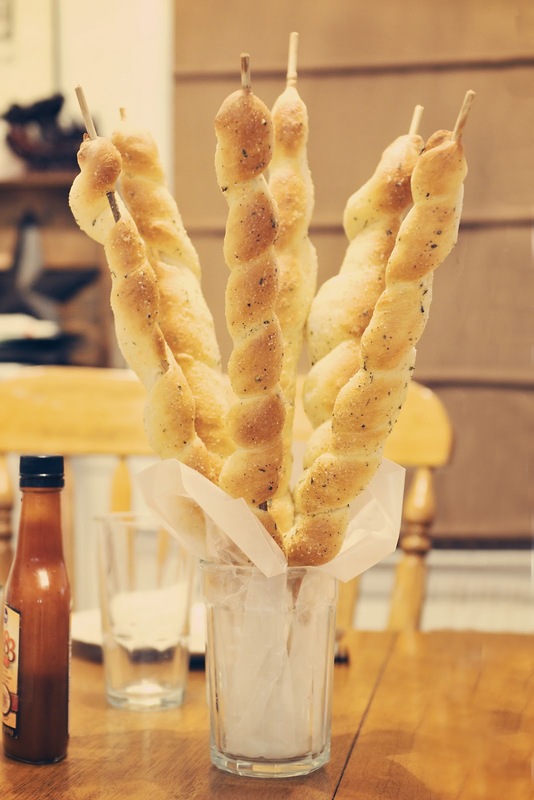 Speaking of unique ways to serve a food—how about baking your homemade bread sticks around barbecue skewers and serving them the way they come at the Pizza Factory? They’re fun to eat and they make lovely table centerpieces when served this way. 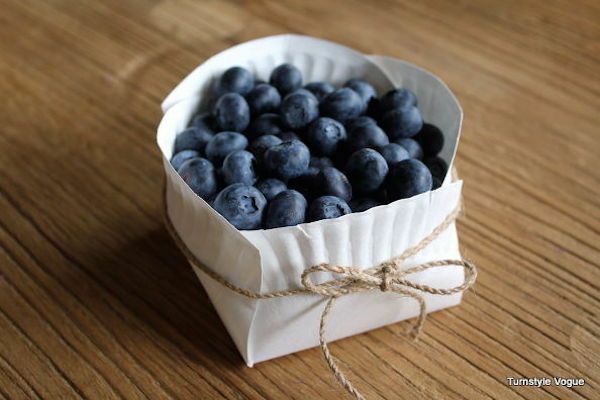 Still on the unusual container idea: Look what you can do with a humble paper plate and some twine. 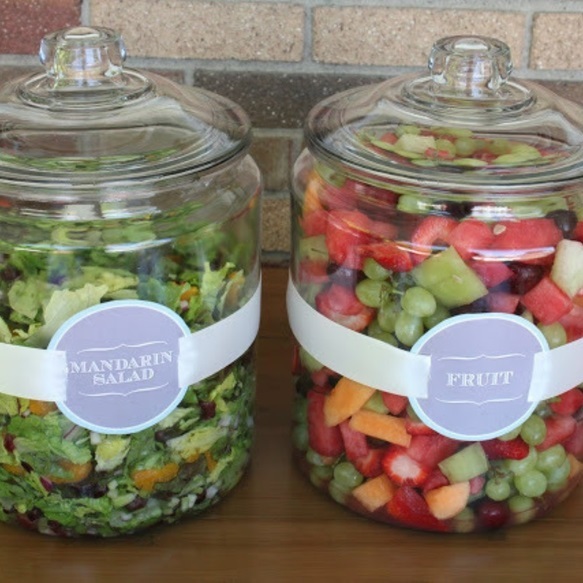 Besides the blueberries, how about individual servings of chips, snack mix, or even guacamole? It’s said that when it comes to food, “presentation is 9/10 of preparation.” Professional chefs agree that while appearance is only one factor in the food experience, if it looks beautiful it does tend to taste better. Whether that’s true or not, it is true that we’re more likely to try it if it looks beautiful. 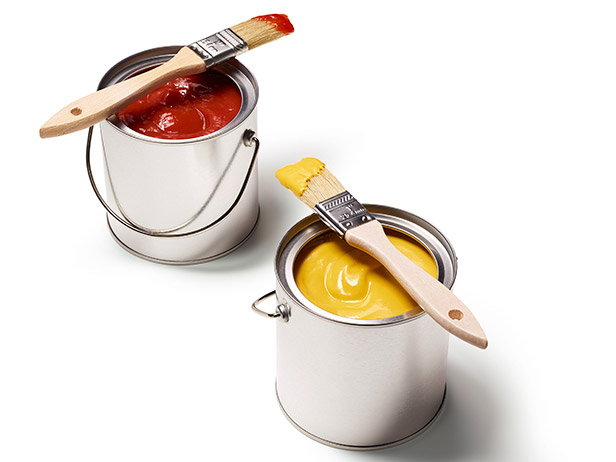 Care for appearance also shows that we have pride in what we’ve made. And efforts at fun and lovely presentation send an unspoken message that those we’re serving matter so much. So with these ideas in mind, let’s get gather folks in for a delicious meal and serve it up with style and flair!